Tim will be happy to hear that in 2009, Germany added 3.8 gigawatts of photovoltaic solar power — about 54 percent of the global market! The US installed a measly 0.47 gigawatts. But within the US, I'm happy to say that California is doing well. 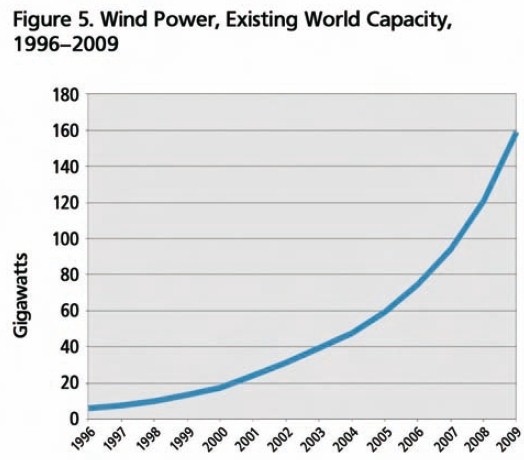 There is a graph for wind power on this page! Tim will be happy to hear that in 2009, Germany added 3.8 gigawatts of photovoltaic solar power — about 54 percent of the global market! The caveat is that I have to pay for those subsidies, and for higher power costs [...] One of the major criticisms is therefore that this policy is unsocial. Sure, only that I have to pay for a high income return for the investments made by house owners, so my solidarity is considerably higher, unless I can earn enough money to buy a house (which would mean I would have to become a millionaire in Munich). Comment Source:Sure, only that I have to pay for a high income return for the investments made by house owners, so my solidarity is considerably higher, unless I can earn enough money to buy a house (which would mean I would have to become a millionaire in Munich). MacKay says pp.39ff that typical efficiency is 10% and the double for expensive ones (theoretical max 60%) on which he bases his UK calc's on. I have another source from OUP called "Energy Beoynd Oil". Frazer Armstrong and Katherine Blundell (professors at Oxford U). The PV chapter is written by Michael Graetzel PV researcher and advocate. there are diagrams on total global production of pv-cells upto 2003 (744 MW that last year). Lab pv-cells have around 35% eff. (fig 8.3) and u loose 0.5% eff per degree C in commercial installations (p.124). Michael the talks about gen 1-thin film, single crystal(Si) ,gen. 2 (low cost) ,and gen.3 (>33% efficiency)eg multi gap tendem cell, qantum dot cells, hot electron converters. 2en.g pv-cells has a payback time of < 1year compared to >4 years for 1gen. PV (fig 8.4). DSC - dye sensitive solar cells are 2gen.with 11% eff. today but it also can produced cheap and allows conversion to hydrogen (using solar photolysis). In the UK it is presently possible to obtain a payback of 41.3 p/kWh on PV up to 4 kW per household, index linked (inflation proofed) for the next 25 years! The cost is being covered by an increase in tarrifs for other users of electricity. And this was introduced by the Labour government? It's great to see you here, Staffan! Thanks for the information! I have taken your information and added it to Photovoltaic solar power in a new section on Efficiency. As you'll see, I'm a fanatic about transferring information to the wiki. I am constantly working to get people here to type interesting facts into the wiki, not just say them here. But luckily, the markup language for the wiki is the same as for this forum, so it's easy to copy remarks from one place to the other. To use this markup language, you need to click the button 'Markdown+Itex' when writing comments. If you let your browser have cookies for the Azimuth Forum, you only need to do this once, and that setting will be remembered. Do it! It's good. Less work and a better result! Comment Source:It's great to see you here, Staffan! Thanks for the information! I have taken your information and added it to [[Photovoltaic solar power]] in a new section on Efficiency. As you'll see, I'm a fanatic about transferring information to the wiki. I am constantly working to get people here to type interesting facts into the wiki, not just say them here. But luckily, the markup language for the wiki is the same as for this forum, so it's easy to copy remarks from one place to the other. To use this markup language, you need to click the button 'Markdown+Itex' when writing comments. If you let your browser have cookies for the Azimuth Forum, you only need to do this once, and that setting will be remembered. Do it! It's good. For example, you wrote: > MacKay (http://www.azimuthproject.org/azimuth/show/David+MacKay) But by changing what you wrote to > `[[MacKay]]` and clicking on the button 'Markdown+Itex', I made your link clickable: > [[MacKay]] Less work and a better result! It took some time becuause i am familiar with textile but less so with markdown but i think i am up to speed now , see Desalination and Navier-Stokes . In the latter i added the default equation using Itex. Comment Source:It took some time becuause i am familiar with textile but less so with markdown but i think i am up to speed now , see [[Desalination]] and [[Navier-Stokes]] . In the latter i added the default equation using Itex. Staffan or anybody: if you could add the names of authors, journals, years, page numbers, etc. to the references on desalination, that would be great! S. E. Zebiak and M. A. Cane, A model El Niño-Southern Oscillation, Mon. Weather Review 115 (1987), 2262-2278. William J. Merryfield, Changes to ENSO under CO2 doubling in a multimodel ensemble, Journal of Climate 19 (2006), 4009–4027. I think that I'm one of the relatively few people here who publishes lots of academic papers, so naturally I'm the one who is trying to make everyone included detailed and accurate references. At the very least, we need to include authors' names, because those authors will someday read our Azimuth Project pages - I promise you, it will happen! And then, if they see their names, they will be happy and may want to help us. If they don't, they will be annoyed and won't want to help us. I know this from previous experience. Comment Source:Staffan or anybody: if you could add the names of authors, journals, years, page numbers, etc. to the references on [[desalination]], that would be great! If anyone wants to see samples of nicely done references, go for example to [[ENSO]]. E.g., here is a lazy one with no links: * S. E. Zebiak and M. A. Cane, A model El Ni&ntilde;o-Southern Oscillation, _Mon. Weather Review_ **115** (1987), 2262-2278. Here's a nice one with links to both the journal version of the paper **and** a free version: * William J. Merryfield, [Changes to ENSO under CO2 doubling in a multimodel ensemble](http://journals.ametsoc.org/doi/full/10.1175/JCLI3834.1), _[Journal of Climate](http://doi:10.1175/JCLI3834.1)_ **19** (2006), 4009–4027. I think that I'm one of the relatively few people here who publishes lots of academic papers, so naturally I'm the one who is trying to make everyone included detailed and accurate references. At the very least, we need to include authors' names, because those authors will someday read our Azimuth Project pages - I promise you, it will happen! And then, if they see their names, they will be happy and may want to help us. If they don't, they will be annoyed and won't want to help us. I know this from previous experience. I added the NREL best research cell efficiency graph to the page. Question: solar cells is a big topic, what kind of information is relevant for the Azimuth project? Comment Source:I added the NREL best research cell efficiency graph to the page. Question: solar cells is a big topic, what kind of information is relevant for the Azimuth project? Question: solar cells is a big topic, what kind of information is relevant for the Azimuth project? How much can solar cells help save the planet? Suppose for example that we need to cut carbon emissions by 7 gigatons/year by 2054, as described in our page on Pacala and Socolow's paper. They suggest that we could cut 1 gigaton/year by replacing 2000 gigawatts of coal power by photovoltaic solar power... but that would require multiplying the 2004 worldwide solar photovoltaic power by a factor of 700 within 50 years! Is that possible? If not, what exactly is possible? We need realistic estimates. What is most urgently needed to improve solar cells? What can scientists do to help? If a student goes into this subject, what are the best problems for them to work on? What do they need to learn? Maybe you can describe a course of study. Comment Source:> Question: solar cells is a big topic, what kind of information is relevant for the Azimuth project? What I'd like to know most is: 1. How much can solar cells help save the planet? Suppose for example that we need to cut carbon emissions by 7 gigatons/year by 2054, as described in our page on [Pacala and Socolow's paper](http://www.azimuthproject.org/azimuth/show/Stabilization+wedges). They suggest that we could cut 1 gigaton/year by replacing 2000 gigawatts of coal power by photovoltaic solar power... but that would require **multiplying the 2004 worldwide solar photovoltaic power by a factor of 700 within 50 years! ** Is that possible? If not, what exactly _is_ possible? We need realistic estimates. 2. What is most urgently needed to improve solar cells? What can scientists do to help? 3. If a student goes into this subject, what are the best problems for them to work on? What do they need to learn? Maybe you can describe a course of study. I take the data from "Renewables 2010 Global Status Report" (http://www.ren21.net/Portals/97/documents/GSR/REN21_GSR_2010_full_revised%20Sept2010.pdf), Fig 7. trend of world solar PV capacity. If I take the data from 2003 onwards, it's an exponential curve with a very good fit of R^2=0.998, and we can reach 700X of the capacity of 2004 in less than 15 years! There are 2 problems: (1) How long can we continue this trend? it's uncertain. China and India are investing massively in new solar power plants, so we will definitely see a surge in capacity and plummet in pricing in the next few years. (2) Making solar cells is an energy intensive process, so we are producing carbon emission while making the cells. This offsets the benefits to some extent. Scientists can help by inventing new solar cell materials, and understand more about the processing, control and characterization of traditional materials: Si, GaAs, CdTe, CIGS. To learn the subject, a student should take courses in quantum mechanics, solid state physics and semiconductor device physics. Joining a lab or company that makes solar cells as intern or research assistant is the best way to get started. Comment Source:These are very good question. Let me try to answer: 1. I take the data from "Renewables 2010 Global Status Report" (http://www.ren21.net/Portals/97/documents/GSR/REN21_GSR_2010_full_revised%20Sept2010.pdf), Fig 7. trend of world solar PV capacity. If I take the data from 2003 onwards, it's an exponential curve with a very good fit of R^2=0.998, and we can reach 700X of the capacity of 2004 in less than 15 years! There are 2 problems: (1) How long can we continue this trend? it's uncertain. China and India are investing massively in new solar power plants, so we will definitely see a surge in capacity and plummet in pricing in the next few years. (2) Making solar cells is an energy intensive process, so we are producing carbon emission while making the cells. This offsets the benefits to some extent. 2. Scientists can help by inventing new solar cell materials, and understand more about the processing, control and characterization of traditional materials: Si, GaAs, CdTe, CIGS. 3. To learn the subject, a student should take courses in quantum mechanics, solid state physics and semiconductor device physics. Joining a lab or company that makes solar cells as intern or research assistant is the best way to get started. I know it's a "we don't know what we don't know" question, but what's your view on whether there's likely to be dramatic gains to be made in solar PV? Is it reasonable to expect dramatic increases in efficiency/decreases in cost if we throw enough R&D money at the problem, or is currently technology close to what's physically possible? Comment Source:Hi "hliang", I know it's a "we don't know what we don't know" question, but what's your view on whether there's likely to be dramatic gains to be made in solar PV? Is it reasonable to expect dramatic increases in efficiency/decreases in cost if we throw enough R&D money at the problem, or is currently technology close to what's physically possible? I think the biggest problem is we don't have a device that can efficiently convert photons to electricity at all wavelengths of the solar spectrum. A single bandgap material is only efficient at converting photons with energy equal to the bandgap. Multijunction solar cells are the highest efficiency because they use materials at several bandgap energies to maximize collection efficiency. Current technology is pretty good with >20% efficiency, but we have to find ways to make it much cheaper if we want to compete with fossil fuel. Comment Source:I think the biggest problem is we don't have a device that can efficiently convert photons to electricity at all wavelengths of the solar spectrum. A single bandgap material is only efficient at converting photons with energy equal to the bandgap. Multijunction solar cells are the highest efficiency because they use materials at several bandgap energies to maximize collection efficiency. Current technology is pretty good with >20% efficiency, but we have to find ways to make it much cheaper if we want to compete with fossil fuel. I would love if it you could take your answers, make them more detailed, and put them on the Azimuth Project. I can help you if you have questions about how. could probably be expanded into quite a nice essay! There must be specific issues that are important here, and particular papers that someone getting interested in this field should read. could be expanded with a list of links to labs and companies, internship programs, etc. It could catalyze the transition where an interested student begins actually working in this area! Making solar cells is an energy intensive process, so we are producing carbon emission while making the cells. This offsets the benefits to some extent. you'll be pleased to know that we already have a page on this topic, written by David Tweed: it's called Energy cannibalism. But maybe you could improve it! Anyway, I really hope you help us. But my philosophy is that people do the best work when they are having the most fun, so I hope you have fun! Maybe there are topics you're eager to write about that I've completely overlooked. Comment Source:Thanks for the answers to my questions, hliang. (By the way: what do you like to be called. "hliang"?) I would love if it you could take your answers, make them more detailed, and put them on the Azimuth Project. I can help you if you have questions about how. For example, this: > 2. Scientists can help by inventing new solar cell materials, and understand more about the processing, control and characterization of traditional materials: Si, GaAs, CdTe, CIGS. could probably be expanded into quite a nice essay! There must be specific issues that are important here, and particular papers that someone getting interested in this field should read. Also, this: > 3. To learn the subject, a student should take courses in quantum mechanics, solid state physics and semiconductor device physics. Joining a lab or company that makes solar cells as intern or research assistant is the best way to get started. could be expanded with a list of links to labs and companies, internship programs, etc. It could catalyze the transition where an interested student begins actually working in this area! As for this: > Making solar cells is an energy intensive process, so we are producing carbon emission while making the cells. This offsets the benefits to some extent. you'll be pleased to know that we already have a page on this topic, written by David Tweed: it's called [[Energy cannibalism]]. But maybe you could improve it! Anyway, I really hope you help us. But my philosophy is that people do the best work when they are having the most fun, so I hope you have fun! Maybe there are topics you're eager to write about that I've completely overlooked. Gordon B. Haxel, James B. Hedrick, and Greta J. Orris, Rare earth elements – critical resources for high technology, US Geological Survey Fact Sheet 087-02, . R. L. Jaffe, Critical elements for new energy technologies, Progress report from an APS-POPA/MRS study. Comment Source:Should we make a link to a page with mineral resources or so (I have no idea where to do this that fits in the text) I wanted to paste these links somewhere: Gordon B. Haxel, James B. Hedrick, and Greta J. Orris, [Rare earth elements – critical resources for high technology](http://pubs.usgs.gov/fs/2002/fs087-02/), US Geological Survey Fact Sheet 087-02, . R. L. Jaffe, [Critical elements for new energy technologies](http://www.eurunion.org/eu/images/stories/session_a5_jaffe_mit.pdf), Progress report from an APS-POPA/MRS study. with a link from Photovoltaic solar power - that page should contain some comment about how high-tech solar cells use certain rare minerals, and a link. Comment Source:> Should we make a link to a page with mineral resources or so (I have no idea where to do this that fits in the text) Sure, maybe a page [[Mineral resources]] with a link from [[Photovoltaic solar power]] - that page should contain some comment about how high-tech solar cells use certain rare minerals, and a link. This popular write-up about this paper I can't get at argues that certain systems which have partially cancelling quantum amplitudes have a higher thermodynamic bound than the classical physics thermodynamic bound. Comment Source:This [popular write-up](http://arstechnica.com/science/news/2011/01/are-photovoltaics-that-beat-thermodynamics-possible.ars) about [this paper I can't get at](http://prl.aps.org/abstract/PRL/v104/i20/e207701) argues that certain systems which have partially cancelling quantum amplitudes have a higher thermodynamic bound than the classical physics thermodynamic bound. B. M. Kayes, H. A. Atwater, and N. S. Lewis, Comparison of the device physics principles of planar and radial p-n junction nanorod solar cells, J. Appl. Phys. 97 (2005), 114302. Comment Source:I've heard Harry Atwater of Caltech discuss ways to beat the classical limit on efficiency for solar cells. This limit, called the [Schockley-Quiesser limit](http://en.wikipedia.org/wiki/Shockley%E2%80%93Queisser_limit), is apparently derived using ray optics, an approximation where light moves in straight lines. But you can beat those limits by leaving the regime where the ray-optics approximation holds good. To do this, you can make the photocell's surface complicated at length scales comparable to the wavelength at light. Click the picture for more: <a href = "http://pubs.acs.org/doi/abs/10.1021/ja074897c"><img src = "http://math.ucr.edu/home/baez/silicon_nanorod.gif" alt = ""/></a> Also: * B. M. Kayes, H. A. Atwater, and N. S. Lewis, Comparison of the device physics principles of planar and radial p-n junction nanorod solar cells, J. Appl. Phys. 97 (2005), 114302.
to the page on Mineral resources, so I added a section that does this. This section summarizes some of Harry Atwater's thoughts about photovoltaics. People should feel free to take the information in this section, add a lot more, and organize it better. Comment Source:Frederik wanted us to include a link in [[Photovoltaic solar power]] to the page on [[Mineral resources]], so I added a section that does this. This section summarizes some of Harry Atwater's thoughts about photovoltaics. People should feel free to take the information in this section, add a lot more, and organize it better. I replaced the graph for wind power with one for PV. Comment Source:I replaced the graph for wind power with one for PV. I replaced your fix by my original jpg, which seems ever so slightly better, perhaps because it's 104 kb. Sorry to be such a nuisance. The key way that scientists can help regarding PV is to pursue characterization of the materials. Most of the bulk PV semiconductors are imperfect, with the cheapest materials highly disordered and often amorphous. The word "anomalous" is used to characterize the transport properties of semiconductors like hydrogenated a-Si, CdTe, and the exotic organics. In my mind, alarms go off whenever you see the word "anomalous" bandied about and it usually means that we don't understand it as well as we should. The current thinking is that the anomalous transport follows Levy random-walk behavior and dispersive transport, according to the theory of Montroll & Scher. I have been following the literature for the last couple of years and it is a fascinating topic to pursue, either for some budding grad student or, quite frankly, us. I believe the case is not closed on PV characterization and I have my own thoughts on the topic that I can help contribute. The only caveat is that transport per se is not that important, as PV's don't really require fast response times, but like all science we might learn something new. One of the big mysteries is what happens with the Einstein relation in these materials. Comment Source:The key way that scientists can help regarding PV is to pursue characterization of the materials. Most of the bulk PV semiconductors are imperfect, with the cheapest materials highly disordered and often amorphous. The word "anomalous" is used to characterize the transport properties of semiconductors like hydrogenated a-Si, CdTe, and the exotic organics. In my mind, alarms go off whenever you see the word "anomalous" bandied about and it usually means that we don't understand it as well as we should. The current thinking is that the anomalous transport follows Levy random-walk behavior and dispersive transport, according to the theory of Montroll & Scher. I have been following the literature for the last couple of years and it is a fascinating topic to pursue, either for some budding grad student or, quite frankly, us. I believe the case is not closed on PV characterization and I have my own thoughts on the topic that I can help contribute. The only caveat is that transport per se is not that important, as PV's don't really require fast response times, but like all science we might learn something new. One of the big mysteries is what happens with the Einstein relation in these materials. The key way that scientists can help regarding PV is to pursue characterization of the materials. Most of the bulk PV semiconductors are imperfect, with the cheapest materials highly disordered and often amorphous. I'm glad you know something about this stuff. Please don't just tell us these facts here - only a few of us will read what you're saying, and we'll soon forget. Please add this information to the page Photovoltaic solar power! And I bet you can add some links. I have my own thoughts on the topic that I can help contribute. The link for the publication "Rare earth elements - critical resources for high technology, US Geological Survey Fact Sheet 087-02." that appears at the beginning of the "The Physics of Solar Cells" section was broken, so I fixed it. Comment Source:The link for the publication "Rare earth elements - critical resources for high technology, US Geological Survey Fact Sheet 087-02." that appears at the beginning of the "The Physics of Solar Cells" section was broken, so I fixed it. I've updated some information at the top of Photovoltaic solar power. As of 2011, photovoltaic solar power had a capacity of 70 gigawatts. Only a fraction of this capacity is actually used, thanks to clouds and night. However, between 2004 and 2009, the capacity increased at an annual average rate of 60%. From 2009 to 2010 the capacity rose from 23 to 40 gigawatts, an increase of 74%. From 2010 to 2011 it rose from 40 to 70 gigawatts, an increase of 75%. REN21, Renewables 2010 Global Status Report, page 19. REN21, Renewables 2012 Global Status Report, page 17. Comment Source:Thanks, Manuel! I've updated some information at the top of [[Photovoltaic solar power]]. <hr/> As of 2011, photovoltaic solar power had a capacity of 70 gigawatts. Only a fraction of this capacity is actually used, thanks to clouds and night. However, between 2004 and 2009, the capacity increased at an annual average rate of 60%. From 2009 to 2010 the capacity rose from 23 to 40 gigawatts, an increase of 74%. From 2010 to 2011 it rose from 40 to 70 gigawatts, an increase of 75%. 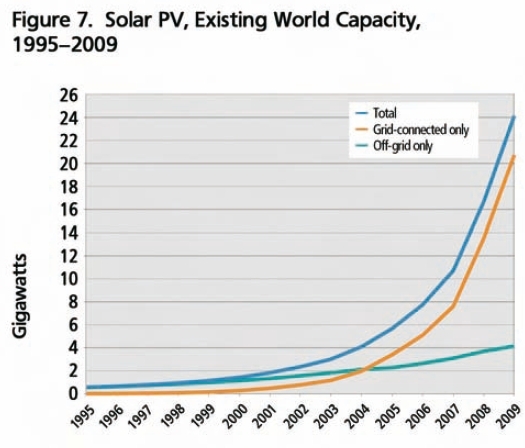 The following chart shows the rapid growth: <img src = "http://math.ucr.edu/home/baez/REN21_photovoltaic_solar_power.jpg" alt = ""/> This chart is from the 2010 report here: * REN21, _Renewables 2010 Global Status Report_, [page 19](http://www.ren21.net/Portals/97/documents/GSR/REN21_GSR_2010_full_revised%20Sept2010.pdf#page=19). and the more recent figures are from: * REN21, _Renewables 2012 Global Status Report_, [page 17](http://www.map.ren21.net/GSR/GSR2012_low.pdf#page=17).